Online poker was legalized in Delaware in 2012 and launched in 2013. The way the framework was established was on a single gambling platform offering the online casino and table games, including poker, with three portals. Each racinos – Harrington, Dover, and Delaware Park would offer online gaming from their properties and websites, advertising individually but running all games on the same platform. Players were to share all jackpots, game options, and prize pools on the site operated by 888poker. Eventually, in 2014, Delaware and Nevada partnered to share online poker tables, as both states offered sites operated by 888poker. The two governors signed an agreement to launch the Multi State Internet Gaming Association, with membership open to other states in the future. The joint venture took more than one year to fully coordinate and launch, and it did not have a significant impact on either state’s cash game traffic. When Delaware and Nevada began sharing online poker players via the Multi State Internet Gaming Association in March 2015, there was some immediate improvement in traffic for Delaware, but no lasting impact could be seen. The small market, despite running on the 888poker name and sharing liquidity with Nevada and its 888/WSOP site, could not seem to improve its traffic. Revenue numbers told an interesting story. December 2013 was the first full month of online poker in Delaware alone, and it delivered a whopping $106,922.76 in rake and fees. By the following December, Delaware was still alone and only showed $28,589.22 in revenue, quite a significant decrease. The number for December of 2015 with its shared liquidity was $31,124.74, a small increase. 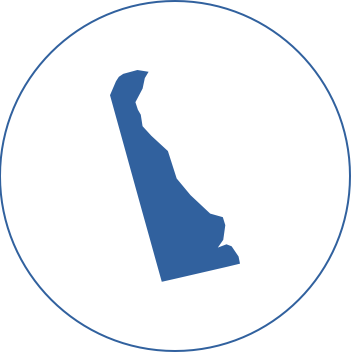 Delaware had been anticipating more than one partnership since it launched its online network, and it finally happened in October 2017. New Jersey joined Nevada and Delaware in an agreement dated October 13, 2017. Those close to the inner workings of the deal indicated meetings were to convene very soon in order to join player pools with expediency. However, as of the start of 2018, there had been no further notices or even indications of a projected date for the three-state liquidity to begin. Only one operator is currently licensed in all three states – WSOP/888. While other sites may be researching ways to establish a presence in other states in order to take advantage of the cross-border player sharing agreement, the singular site qualified to do so at the beginning of the project is WSOP/888. Its combined player pools are anticipated in the spring or summer of 2018 for players in Delaware, Nevada, and New Jersey. 333 introduced May 9, 2012. House passed bill June 12, 2012. Senate passed bill June 27, 2012. Governor Jack Markell signed bill into law June 28, 2012. Delaware Lottery issues final regulations September 10, 2013. Online poker went live November 8, 2013. Delaware signed interstate compact with Nevada February 25, 2014. Interstate market went live March 24, 2015. What About Other Types of Gambling in Delaware? Yes. The first legalized gambling in Delaware came in 1974 with the state-run lottery. Twenty years later, the racetracks in the state, which already permitted pari-mutuel betting, were allowed to add video lottery terminals, making them racinos. In 2009, gambling expanded with legislation allowing table games (blackjack, craps, roulette, and poker) and sports betting at the racinos. The three racinos in the state are Delaware Park Racetrack & Slots in Wilmington, Dover Downs in Dover, and Harrington Raceway & Casino in Harrington. The poker chapter addresses everything about land-based poker from term definitions, to hand rankings and game rules, from tournaments to licenses. Primarily, the details were dedicated to charitable gaming, which is why the “no limit” was removed from the name of the game and there are no references to internet poker. In Title 11, Section D describes offenses involving gambling. Advancing gambling in the first or second degree is a class A misdemeanor, and other crimes include providing a premises for gambling, possessing a gambling device, playing craps, or unlawfully disseminating gambling information. This seems to pertain mostly to lotteries. Poker revenue to mean total value of rake charge to players at all poker tables. Table game to mean any game played in a video lottery facility with cards, dice, or electronic machine including poker. Table game win or loss to pertain to gaming tables other than poker. The document set the age for online gambling at 21 for table games, excluded any officers or employees of the state lottery office from participating, and designated gross revenue from the games to be accounted to the state treasurer. Monies will then be dispersed by the first $3.75 million of each fiscal year to the State Lottery Fund for the benefit of the state with the remaining distributed per designated calculations. In addition, it should be noted that the regulations included the option of partnering with other states via interstate compacts by which some games – like online poker – could share liquidity and prize pools. Question: Why is traffic so low on Delaware poker sites? Answer: The population of the state is low in general, as compared to other states. The sharing of players pools with Nevada does give players more game and tournament options on the sites, but players may not likely find it worth much time to play until the three-state liquidity with New Jersey begins. This will enable the sites to offer more stakes, game variations, and larger tournaments with larger guarantees, all of which will attract more players. Question: Do Delaware players still frequent offshore sites? Answer: Yes. Only a few offshore sites even offer online poker to residents of Delaware, but there are a few. Some players still prefer those sites to the state-regulated ones because of the variety of games, more promotions and bonuses, and more lucrative tournament options. Question: What are requirements to play on regulated sites in Delaware? Answer: Players need only be 21 years old and be located inside the borders of Delaware at the time they choose to play online. There is no residency requirement, as visitors to the state are allowed to play on the poker sites as well.